I have a little theory. Humour me if you will, while I talk it through. You see its this: I believe there's a correlation between culinary skill and life-stage. For example, you haven't moved out of childhood until you can be trusted to use a kitchen knife. And you're not really an adult until you can prepare a meal on your own. So when I decided to include glazed ham as part of our Christmas festivities this year, I felt sure that it meant I must finally be very grown up indeed. The picture in my head was of an edible show-piece, worthy of the sort of reveal that should always be accompanied by a big ta-dahhhhh. Mid-afternoon yesterday I departed the last of our lunch celebrations at my parents' place and hurried home to begin preparing the ham ahead of the dinner guests arriving. I whipped the ham out of the fridge with a flourish, forgetting its weight. The momentum behind 4 kilos sent the ham straight to the floor. Hmmpph. A dent on one side - perhaps the guests wouldn't notice. I braced myself and hoisted it back on to the bench. After struggling with shrink-wrapped plastic, I set about to remove the rind. All the instructions I had read, suggested this was no harder than say, peeling an orange. My prissy, ineffectual little cuts with a kitchen knife brought no joy. Maybe the knife was a bit blunt. I started to cut and hack until preparations were beginning to look less White Christmas and more shower-scene-from-Psycho. Success. Having cleaved the rind, I tried to pull it away. It was kind of stretchy and rubbery. I pulled. It became sort of a ham tug-o-war. Pull, pull, pu-u-u-l-l-l-l. Ah-ha -it started to come away ... when suddenly ... the ham rind snapped like a giant rubber band. Thwack. 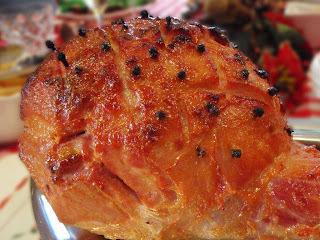 Ham rind in the side of my head. And as I stood there with bits of ham fat and meat in my hair, stuck to my face and alluringly across my decolletage, I giggled hysterically. Perhaps I still have a bit of growing up to do. Oh dear that ham was causing just a little trouble. I take it from the picture that you wrestled it into submission! Hope the rest of your preparations were less troublesome. Haha...this sounds a little like the scene I saw at my mum's house and she's got a seniors card! Hilarious! Hope you had a very Merry Christmas. ..or you might need to stop drinking before food preparation tee, hee.